davidgeebooks: Theatre at the cinema: "Fasten your seatbelts. It's gonna be a bumpy night." Welcome to SHAIKH-DOWN author David Gee's blog. Share your views on the books he's reading and the TV and movies he's been watching. Details of forthcoming David Gee novels will also be posted here. Watch this space! Theatre at the cinema: "Fasten your seatbelts. It's gonna be a bumpy night." 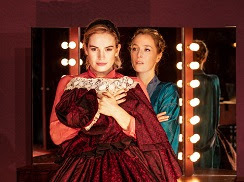 Having given us her (magnificent) take on Blanche Dubois a few years ago, Gillian Anderson now brings another of the 20th-century’s great screen ladies to the stage: Margo Channing, a role Bette Davis played like a fire-breathing dragon. Ms Anderson attacks the role with appropriate scenery-chewing gusto; I wanted to applaud when she delivered the key “fasten your seatbelts” line! The set combines backstage scenes with video close-ups which build a vivid bridge between stage and screen. The male cast members, I should add, are uniformly splendid, but this is a play about women. Monica Dolan is excellent as Margo’s best friend Karen (Celeste Holm in the movie) and Sheila Reid milks some good laughs from the part of Birdie, Channing’s put-upon dresser (Thelma Ritter in the movie). It’s hard not to picture Sheila Reid as Madge, driving her wheelchair like Boudicca’s chariot in ITV’s Benidorm. Gillian Anderson will forever be Agent Scully to me (and maybe to you too), and a hint of Scully’s vulnerability neatly underscores her steel as Margo. I hope she adds Norma Desmond to her CV in the near future! Gorgeous Lily James plays the pivotal role of Eve Harrington, the star-struck fan who becomes Margo’s PA and then her understudy and finally her nemesis. James has done good work in movies and TV and she is good here too, but her performance lacks the subtlety of Anne Baxter’s in the movie, although this may simply have been lost in the translation from screen to stage. A great actress (I know, I’m supposed to say actor) inhabits the role she is playing, becomes the character. Judi Dench, Vanessa Redgrave, Maggie Smith – they always do this. Bette Davis was Margo, just as she was Baby Jane Hudson. Joan Crawford was a good actress, but as with so many actors you could see her applying technique to the role. Bette Davis (ditto Katharine Hepburn) was a great actress; you see the character, not the technique at work. Gillian Anderson brings that touch of greatness to her roles. Lily James does not – not yet – but I think she will. 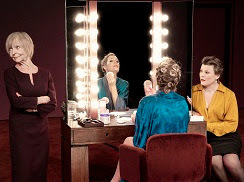 NT Live will bring “Encore” showings of All About Eve to cinemas in your neighbourhood. For a fraction of the price of a theatre ticket you will get a masterclass in acting. Not to be missed.